My Dragon’s Blood Tea Lights are here to help you step into your power and slay any negativity that has overstayed its welcome! Dragon’s blood is a powerful resin filled with strength and banishing energy to rid you of any darkness. Its protective powers are so strong it will stop negativity right in its tracks! 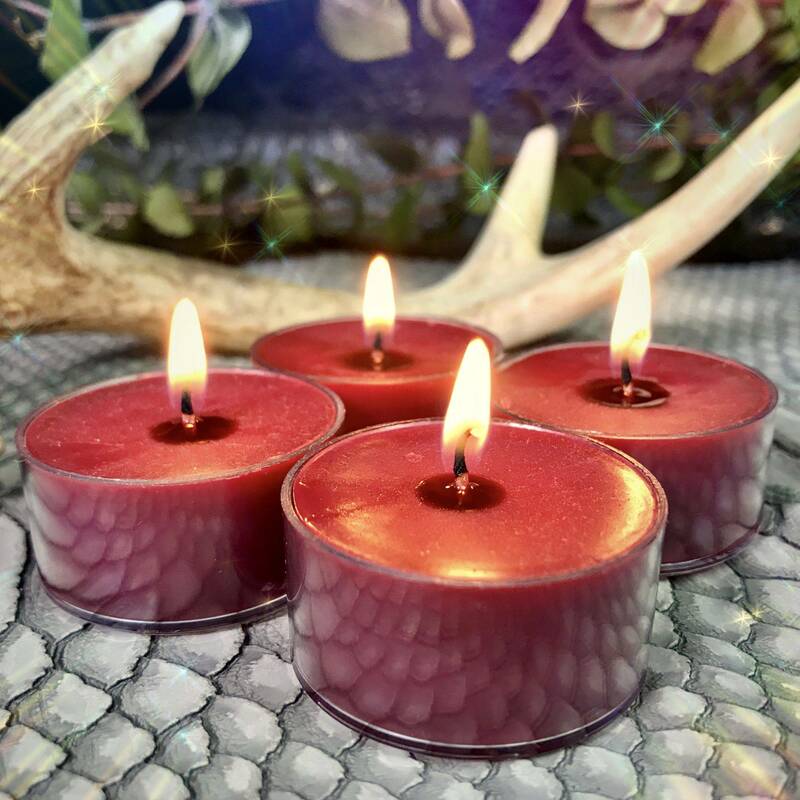 These tea lights are blended with dragon’s blood oil and dusted with dragon’s blood resin for a double dose of personal power. In the age of our ancestors, the warrior women looked fearsome dragons straight in the eye and declared their bravery. Some medieval encyclopedias even say that dragon’s blood is derived from the dragons who perished in combat, and I like to think our sisters were the ones who didn’t back down at their mighty roars. Much like the champions we descend from, with dragon’s blood on our side, we can slay any darkness or negativity in our past. My Dragon’s Blood Tea Lights are the perfect companion for anyone wishing to cut cords with past wounds. Dragon’s blood gives a boost of tenacity and also heals, protects, and banishes negativity. My Dragon’s Blood Tea Lights come beautifully packaged in an eco-friendly cardboard window box with information about the lore of dragon’s blood and how to set some intentions when burning your candles. Spark it up and prepare to vanquish anything holding you back! This listing is for one (1) four-pack of Dragon’s Blood Tea Lights, which will come lovingly parceled, ready to burn in your sacred space. It’s just an absolutely beautiful scent that makes me feel safe and warm. I light these on my alter and when cleansing negative energies from my home.